Editor’s Note: This is the second part of an article and interview with first term State Representative Armando Walle, District 140. Walle went to Austin in January, but it was several weeks before committees were assigned, and work began. In the meantime, caucuses met and acquaintances were made, and some orientation for freshmen legislators took place. Walle was assigned an office in the new underground wing, a well appointed addition to the existing capital, and much better than some of the basement offices that previous legislators had to use. His committee assignments were to Human Services, where he worked on hearings for bills about aging, childrens health care, CPS and more; and Urban Affairs, which included hearings on housing, weatherization programs, and other urban issues. In part one of this article, we detailed the bills that Walle helped write and pass, including the Grafitti Bill, which increased penalties for grafitti offenders and amended definitions of grafitti; two Fire Fighter Bills, granting a paid holiday on 9/11 to firefighters in honor of their brave sacrifices, and a bill on grievance resolution; an amendment to direct TEA to study high drop-out rates of students with low English proficiency; and an amendment to direct the DMV to require diversity training in their customer service ranks. In all, Walle authored or cosponsored 9 bills, of which 3 went to the governor for approval. 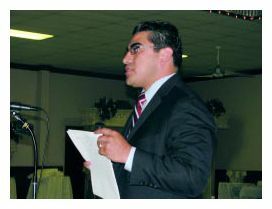 He worked with local legislators such as State Senator Mario Gallegos on bills of interest to his constituents. Others in the Houston delegation included Sylvester Turner, Bill Baligari, and Senfronia Thompson. Bills that Walle filed, but did not get action or pass, included a bill limiting junkyards; two bills limiting utility water rates, one stating that rates could not rise more than 20% in a 3 year period, the other that a local hearing was required before rates could be acted on by TWDB; and a noise ordinance. Walle expects all of these to come up again in the next session, with better results. This legislative session did present a balanced budget to the Governor, in the amount of $180 billion dollars. However it spent a lot of time on the Voter I.D. issue, without resolution. Walle sees small steps of accomplishment in some of the legislation that was acted upon. In summary, he points to his Grafitti bill; the defeat of the Voter ID bill, which would have disenfranchised many minorities and others; Tier One Universities will be fostered with new legislation, and the Top Ten Percent regulation will stand for now, but UT Austin will open up more slots for excellent students; an expanded Texas Grants program for qualifying families who need financial aid; School Finance Reform will improve reimbursement formulae by using federal Stimulus dollars, and also grant teachers a minimum $800 raise; Windstorm Insurance funding was approved; $180 billion budget increased health, human services and education programs, without a tax increase by using federal stimulus dollars; Small Business Tax Relief was increased. Walle cited some “missed opportunities” as CHIP not being expanded; Unemployment compensation was not acted on properly; Tuition to universities was not capped; TDI/Insurance department was not acted on to limit high rates; Utility Rates were not held in check; Medicaid Reforms/12 month applications were not enacted. Walle may be called back by the Governor into a special session, to deal with some of the issues that were not resolved. In the meantime, he is making plans to enter Texas Southern University and work on his Law Degree. Approximately 350 people packed the Tradition Party Hall Room B last week to protest a request by Big K for a permit to expand their waste processing facility on Little York Rd. Tap Inc., which does business as Big K, has requested a Type V Municipal Solid Waste Permit Amendment to authorize processing of liquid waste from the Texas Commission on Environmental Quality (TCEQ). At the urging of affected nearby residents, State Rep. Armando Walle, and other elected officials, the TCEQ held a meeting in Houston last Tuesday night at a banquet hall about a mile from the facility. Porfirio Espinoza, who lives near the facility, said that the area constantly stinks from the waste being brought in by trucks. He said that Big K’s presence has caused property values to fall and that he is afraid that if the company is allowed to expand the problem would get only worse. “My children cannot play outside (because of the smell),” he said. “We don’t want them in our community,” added resident Maria Hernandez. Big K has been in operation since 1999. Tom Page bought the facility in December 2003. In January 2008, he filed an application to expand the facility, add additional operating hours and expand into liquid waste collection such as restaurant grease. The facility is currently authorized to handle only solid municipal waste. Walle also said that he was concerned with the possibility of waste runoff in the event of a flood, as well as Big K’s history of violations, documented in a letter to TCEQ from the Harris County Attorney’s office. Page admitted that there were violations in the past, many of which he inherited when he bought the facility and that he was making efforts to come into compliance. This statement was not accepted by some in the audience who claimed that Big K continued to accept restaurant grease without a permit until they were caught. 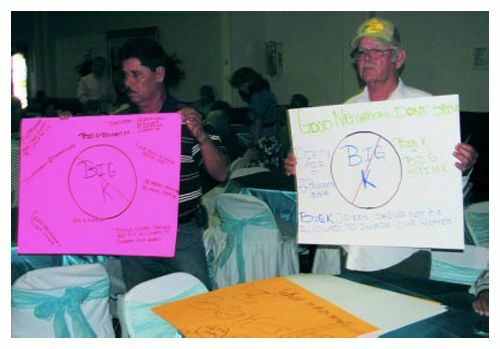 The only reason Big K was even seeking the permit amendment, they said, was because “they got caught with their hand in the cookie jar,” as one resident expressed herself. Mark Hrbeck, an engineer hired by Big K to prepare the permit application, defended his client. He said that the issue over the grease was an “administrative misunderstanding” and that Page was unaware that it was happening until the City of Houston stopped the practice. The Harris County Attorney’s office has also filed an opposition to the permit request. They cite previous environmental regulation violations and well as the proximity to residents, businesses and churches. Residents also challenged Big K, saying that the permit would mean heavier truck traffic on the road, with would make potholes that the taxpayers would have to pay to fix. Residents were reminded that the TCEQ had no jurisdiction over roads and that their concern was what happens at the facility. “The last thing Tap Inc wants to be is a bad neighbor.” Hrbeck said, noting the facility will be safe and claimed that there will be no discharge and that no hazardous material will be handled at the site. Page and others were not allowed by meeting rules to answer questions directly. But in response to questions after the meeting, Page told the Northeast News that many of the complaints about smells, hours and traffic were really a result of activity at the adjoining business, USS or United Site Services, a company which he said is not owned or affiliated with Big K. In fact, he said, he only owns two small trucks, and all his collected waste is contained and not open to the air. Walle, when advised of this fact, suggested an additional hearing might be necessary to investigate these facts. Donna Phelps, regional director of the field operations division for the TCEQ, said that comments taken at the meeting would be put into the record. At the close of the public comment period the commission will consider any requests for a contested case hearing. After that the thee-member TCEQ Commission will decide to approve the permit amendment request, deny the request or approve the request with conditions. Prior to the meeting, the TCEQ had their own team of investigators examine the application and the facility to determine if the request met state environmental requirements. “The permit meets all the technical aspects for compliance with TCEQ regulations,” said Ashley Wadzick, special counsel to the TCEQ Executive Director. At its regular board meeting last Tuesday evening, the announcement was made that all the Sales Tax Revenue Bonds previously authorized by the board had been subscribed and sold that morning. This means that the related revenue will be available for the improvement projects tied to the bonds, according to EAMD Executive Director David Hawes. The total bond sale was for $13,365,000, and the bonds will pay approximately 4.75% interest by the end of their terms, graduating from an initial interest rate of 1.3%, and be due for redemption in twenty years, or mature before in some cases. Hawes said these terms were favorable, and indicated that the financial community held the District in high regard. In fact, the bonds were to be issued with a Standard & Poor’s rating of AAA, and the District was rated A. The bonds are guaranteed by a lien on the state 1% sales tax levied in the district, and in addition an insurance policy by the underwriters. Proceeds of the bond sale will be used for improvement projects already in the planning stage by the District. These include Water Distribution east of US59 (Service Zone 11), $1.27 million; Wastewater gravity lines in same area, $1.36 million; Related lift station and force main for above, $1.265 million; Water & wastewater in North Houston Heights, $3.28 million; Transportation and Mobility work throughout district, $2.79 million; Engineering for above, $1.948 million; Contingency, $587,000; fees related to bond sale, $865,000. In its sales prospectus or Official Statement, it is noted that the District has previously issued Sales Tax Revenue Bonds, in the amount of $3,195,000 in 2005, that were used for improvement projects at that time, that have been completed. It is also noted that future bond sales may be initiated for additional projects. The board approved three consulting contracts that will be related to the work funded by the bonds: Wilbur Smith Associates, for consulting and planning services, Montgomery and Associates for engineering services, and Kudela & Weinheimer for landscape and signage work. On the east side of Harris County there sits a plot of land not more than a mile wide and a couple of miles long which played a key role in the independence of Texas and the development of the entire Southwestern United States. It was at San Jacinto that an army led by Sam Houston defeated Santa Anna, thus winning Texas’ independence. The U.S.’s annexation of Texas in 1845 led to the Mexican American War of 1846-48. Mexico’s defeat added the territories of California, Arizona, New Mexico and part of Nevada, Colorado and Utah to American soil. A 570-foot monument now stands on the site of that battle. 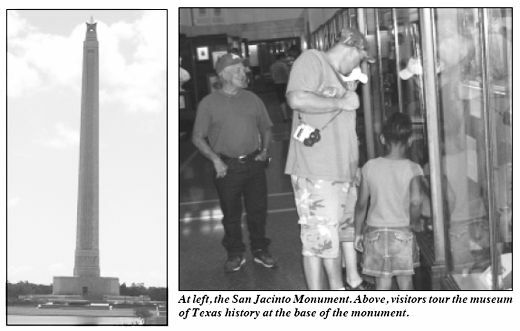 In the base of the monument is a museum which documents Texas’ history going back to precolonial Mexico. A large portion of the museum is dedicated to the Texas Revolution and early days of the Republic. The museum, which charges no admission fee, also had artifacts from Texas’ involvement in the U.S. Civil War and well as postwar Texas. 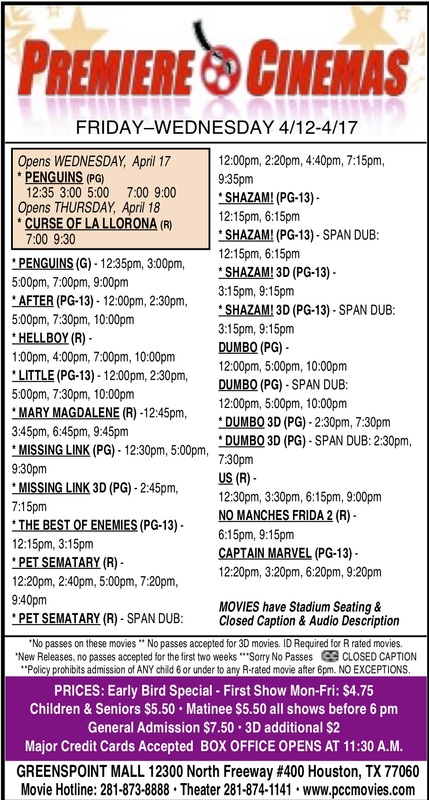 History buffs can also see the events unfold on the silver screen in the film “Texas Forever.” Admission to the film is $4 for adults, $3.50 for children under 12 and seniors 65 and older. For a fee of $4 visitors can take an elevator to the observation deck nearly 500 feet in the air, where they can get a bird’s eye view of the ship channel and surrounding area. The San Jacinto Monument and Museum are located at 3523 Battleground Rd. in Deer Park. Park hours are 9 a.m. to 6 p.m., open seven days a week.